The next morning we met Linda at her house, and went for a morning walk with her. 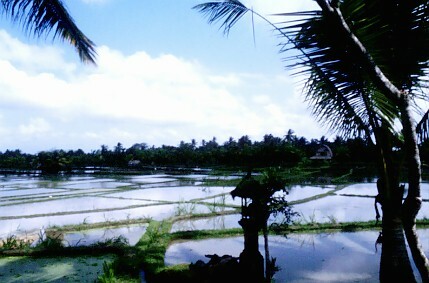 If you keep walking up Jalan Kajeng, within a few minutes you find yourself out in the countryside amongst the rice fields. 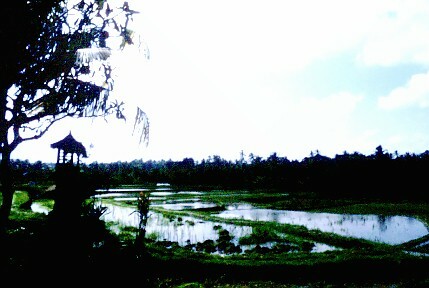 It was a very tranquil scene, with rice fields at various stages of their growth. 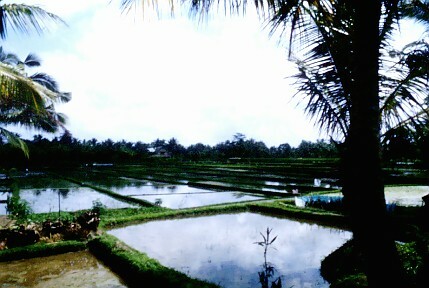 Rice grows in only a few months, so they do several harvests a year in the same rice field. 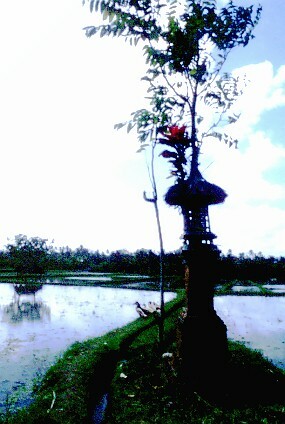 Every so often we would come across a shrine to Devi Sri, the rice goddess. 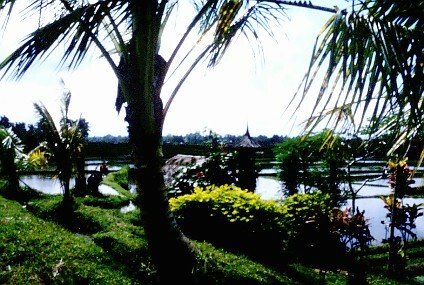 We learned later how important the rice goddess still is in Balinese ritual - the rice harvest is crucially important to the Balinese and the influence of the rice harvest permeates much of the religious activity, underlying many of the Hindu-Buddhist ceremony that overlays earlier belief systems. As we were walking, a Balinese woman came up to us and offered us a freshly cut coconut from one of the trees. She cut it open with a very sharp looking hatchet and we drank the clear coconut "milk". Dan is enjoying some coconut milk while Julia watches. Be warned that drinking too much coconut milk can have a laxative effect! On the way back towards Linda's house we passed by the Banjar hall. 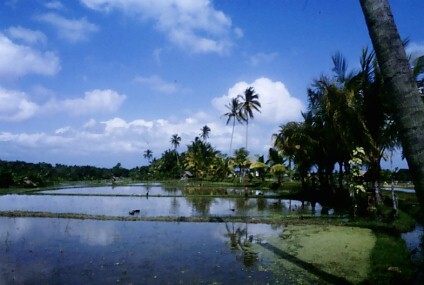 The Banjar is the local village council, composed of all the married men of the village. They decide on local laws, like whether a new house should be built, the road repaired, or a hotel should go up. 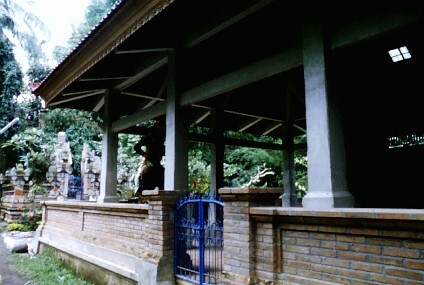 The Banjar hall is also used for public performances of gamelan music or shadow-puppets. Check out the stone carving at left. A few houses along from Linda's is a "health resort" run by Dr.Jim, who was originally from Santa Cruz, where we live in the States. He retired from his doctor's practice in the US and opened this health resort where they offer massage, yoga, aromatherapy, and other great-sounding stuff. 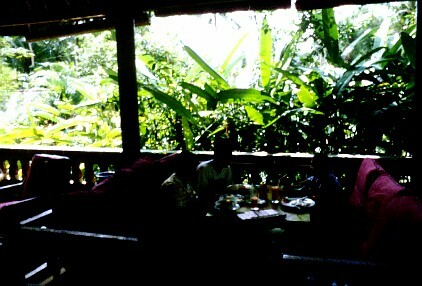 They also have an excellent vegetarian restaurant where we stopped to have lunch. Those mango smoothies were already growing on us.